LAHORE – A number of University of Education (UoE) students held a demonstration on Thursday seeking the reinstatement of Dr Anwar Rehman Pasha and his wife Dr Shireen Pasha, who were sacked by the university’s vice chancellor Dr Farhat Cheema on corruption allegations a few days ago. The students demanded that the Punjab governor and UoE Chancellor Latif Khosa terminate the VC, claiming that she had sacked the professors due to personal grudge. They claimed that 38 students from the IT department have already been expelled from the varsity and their entry has been banned from the varsity premises. Students claimed that the VC’s contract was about to end and she had sacked Dr Pasha to prevent his appointment as the next VC. Students claimed that Farhat Saleem called two selection boards and appointed her favourites from all 10 campuses of Punjab. They alleged that Dr Saleem was the “blue-eyed” of former VC UoE Dr Munawar Mirza who appointed her as interim VC against the rules. 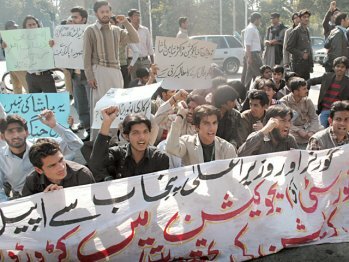 The students accused the bureaucracy of supporting Dr Saleem, but said they would force the government to give in to their demands. A student named Saim said, “Students will be forced to take extraordinary steps if their demands are not met.” A student, identified as Umair Iqbal tried to immolate himself during the protest in front of Governor’s House but his fellow students thwarted his attempt. Commenting on the statement of Dr Saleem that “I will not reappoint the terminated teachers”, students declared that they will leave no stone unturned to corroborate the restoration of Dr Pasha and his wife. Students claimed that the committee formed to solve the issue, comprising two VCs from GCU and UET, decided in favour of Dr Pasha but the details of the committee decision were not disclosed. A controversy started after Dr Saleem sacked Dr and Mrs Pasha over complaints by the faculty members and students, which were verified by the university inquiry committee. Charges on the two range from ‘favouritism, inappropriate behaviour, misdemeanor and misconduct’ with faculty and students, ‘discrimination’ against non-IT staff and students and ‘threats of termination’ and transfer to instigate student body to go on strike and demand that Dr Pasha be promoted.